Patna High Court Admit Card 2019 is Released…!! 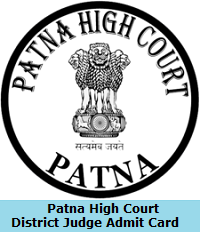 The High Court of Patna officials released Patna High Court District Judge Admit Card 2019 on 15th March 2019 @ www.patnahighcourt.gov.in. Candidates who had applied for District Judge (Entry Level) posts, they have to attend for the examination along with Patna High Court District Judge Hall Ticket 2019. The examination date clearly mentioned in the Patna High Court Admit Card 2019. Candidates should download the Patna High Court District Judge Admit Card 2019 from this page by hitting on the below given link. Candidates who have successfully completed the application process for the District Judge entry-level position in High Court of Patna and waiting for the admit card to participate in the Prelims Exam, here is the great news for everyone. The management of Patna High Court has recently released the hall ticket for Judge Preliminary examination on 15th March 2019. We advise every applicant can download the admit card 10 days before to participate in the exam. To download the Patna High Court District Judge Admit Card 2019, every applicant needs login details like Registration ID and Date of Birth, without these details will not possible to get the hall ticket. The applicable candidates can directly download the Patna High Court District Judge Admit Card 2019 from below provided link at the end of this article and this link is directly associated with the official website of Patna High Court. The more details of Patna High Court Admit Card 2019 has provided below. The Patna High Court District Judge Entry Level Preliminary Exam Admit Card 2019 is available to download now. The organization has officially uploaded the admit card on their website. So who needs to participate in the exam must download the admit card from the official website of High Court of Patna @ www.patnahighcourt.gov.in. Now, this the time to get the hall ticket for examination will be conducted in the upcoming months. When download the admit card the candidates must check the information. If there is any correction immediately inform to examination board. After the Preliminary examination process, the other details like result date and Mains exam scheme will update soon in this article. For more updates just click on Sarkari Recruitment. Without the hall ticket, the organization will not allow writing the examination. The admit card or hall ticket can play a key role in any examination process. The Hall Ticket will more useful to management to find the fake candidates in the exam hall. The admit card had important details like Candidate Name, Photograph of the candidates, Exam name, Exam Center Name, Exam Center Code, Exam Hall Address, candidates Address, Mother or Father Name, important instructions for the examination. the applicants will need to carry an identity card like Voter Id, PAN Id etc along with admitting card. Everyone will attend in 20 minutes before the exam too and check the information in the back of the hall ticket. The interested candidates can also check the All India Exams Admit Cards in one place through this article. Other details of Patna High Court District Judge exam like notification, important dates, steps to download the admit card etc has specified below. To recruit the candidates for District Judge entry level position the High Court of Patna will follow the Prelims, Mains, Interview and certificate verification process. Initially, the organization will conduct the Prelims exam for eligible candidates. Through this test, the qualified candidates will need to face the mains exam after a few days. From these two rounds, the selected candidates will have to participate in the interview and finally certificate verification. For more details, applicants need to check the official notification of the High Court of Patna. Admit Card is the critical document for every examination process. After releasing the Patna High Court Admit Card 2019 aspirants should be downloaded. And also exam date is announced, so candidates have to store their Patna High Court District Judge Hall Ticket 2019. Applicants have to check the downloaded Hall Ticket because some contenders facing problems. And also check the details like name of the contender, signature and also the photograph. If these details are not correct you could not enter into the District Judge written exam. So aspirants check the hall ticket if any mistakes have appeared on the Patna High Court Admit Card 2019. Then immediately consult the higher officials. And change the details which are not correct. If candidates did not check the Hall Ticket and attend for entrance exam they are not allowed because the higher officials will treat them as false candidates. So as early as possible applicants change the mistakes. Participants have to must and should check Admit Card. The applicants must need to visit the High Court of the website, www.patnahighcourt.gov.in. Search for the Patna High Court Admit Card 2019 download link in Notices and Notifications section. Submit the details what candidates have entered. Download the Patna High Court admit card. Save or Take a printout of admit ticket to submit to examination center along with any id proof. Through the above article, we have provided the details of Patna High Court Admit Card 2019 and exam of District Judge entry level. And we hope it will more helpful to who had applied for the Judge position in High Court of Patna. Leave a query for further clarification through below comment box. For more updates keep following our website Sarkarirecruitment.com. Thank you.